Oliver Gildart has today been called into the England squad for this autumn’s series against New Zealand. The 22-year-old, who was Super League’s Young Player of the Year in 2017 and has played an important role in the Warriors’ progress to Saturday’s Betfred Super League Grand Final, fills the place vacated by the withdrawal of Sam Burgess because of injury. Gildart had been due to travel to Papua New Guinea via Brisbane next week with the England Knights squad who will play two internationals against the Kumuls. But instead he will stay on these shores and join Wigan team-mates Sean O’Loughlin, George Williams, Sam Tomkins, John Bateman and Joe Greenwood in Wayne Bennett’s England squad. 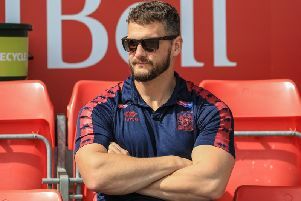 His place in the Knights squad has been taken by Salford full-back Niall Evalds, and coach Paul Anderson has also called up Warrington winger Tom Lineham as a replacement for Castleford’s Greg Minikin, who has withdrawn because of injury. Wigan and Warrington players are not expected to figure in that Test but Romain Navarrete and Morgan Escare have been included in the France squad.